The CounterBalance platform offers Operations and Customer Relationship Management (CRM) for small to large businesses. Manage your leads, customers, orders, fabrication, services, vendors, sales personnel and cost item inventory. CounterBalance can be customized to fit your current customer and operation needs. Build custom process flows for sales and order fabrication/fulfillment with payment schedules, operation wide scheduling, custom forms/emails, inventory allocation, services management and other events. Replace your disconnected spreadsheets, file shares and calendars with Counter Balance's integrated management control that provides clean and concise decision making for your customers and associates. Clarity of each and every customer the moment you speak with them. Don't let appointments, payments and customer information slip through the cracks and waste valuable time. CounterBalance will return your focus to your operation and customers. Customize your CounterBalance system for construction, parts manufacturing, research, retail sales and more. 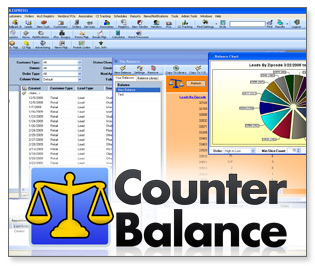 Click here to view the complete overview of CounterBalance and all of it's features. The Ball Park Application delivers consistent and convenient quotes. Create and save multiple quote templates for any product and service your operation provides. Each quote can very in product/service types, quantities and options. 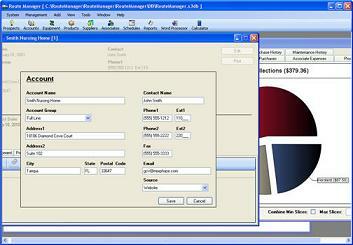 Design custom quotes forms within the built in word process. Now is the time to provide your sales staff with tools that handles the estimate process and get them back to achieving your sales goals. Click here to view the complete overview of Ball Park. The Route Manager application offers Operations and Account Management for small to large vendingoperations. Manage your prospects, accounts, products, suppliers, associates, scheudles, and reporting data. Route Manager can be customized to fit your current account and equipment needs. Replace your disconnected spreadsheets, file shares and calendars with Route Managers's integrated management control that provides clean and concise decision making for your accounts and equipments. Clarity of each and every account the moment you speak with them. Don't let appointments, products and prospect information slip through the cracks and waste valuable time. Route Manager will return your focus to your operation and customers. Click here to view the complete overview of Route Manager and all of it's features.